The Li 1 was Innocenti's flagship. However, it was really a prototype and had several disadvantages which became apparent in road use. The larger 150cc version was launched in April of 1958, with the smaller 125cc version following in June, both models were an instant hit with the buying public. A wholly new design of body work, and engine saw the Lambretta take its primary features of all subsequent models. A new engine was designed and developed, to overcome these problems, available in both 125cc and 150cc formats. The engines for the first time featured a horizontal cylinder, chain drive, and four speed gearbox. The chain rotated the crown wheel which housed the clutch within it, this then drove a gear cluster and four seperate gears out through a shaft. This proven layout which was developed due to the problems with the larger 175cc engine would be the layout and design of all future Lambrettas. Some changes were made to this engine, mid production, as the very first models came with no chain tensioner, plus a single magneto side oil seal to which the bearing was lubricate by the petrol / oil mixture. Later models gained a chain tensioner, and a self lubricated magneto side bearing, encased by two oil seals. Also around the same time, an oil deflecting washer was added underneath the front sprocket sleeve, to help keep oil away from possibly entering pass through the drive side oil seal. As for the body work was almost identical to the T.V, except the side panel slots had gone, although it is though a small number of Li models did actually leave the factory wearing the "TV" stye side panels with the cut outs. A curve was pressed out of the offside rear floorboard, and the side panel to allow the newly designed kick start to operate. New curvey lines found their way into the design, and the new "wide style" Lambrettas lines flowed where ever you looked. To maintain the machines looks, a large curvey mudguard was fitted to the front, with a small inner mudguard to take the worst weather away from the cables. The headlight unit was positioned in the same place as the earlier LD models, cast into the horn casting. A speedo was fitted as standard on handlebar casting to the 150cc models, but as with the laws in Italy not requiring them, the 125 was supplied with a alloy blanking plate if the cost option of the speedo was not taken up on the 125 models. Also built into the handle bars was a steering lock, the lock aperture being covered by a chrome plated flap. Larger 10 inch wheels were fitted for increased comfort and stability, along with newly designed trailing link with internal springs front suspension, and rear shock absorber unit rear suspension. The early machines were known as 'frame breathers', due to the air intake being at the rear. the new Dell'Orto MB18 on 125 models, and MB19 on 150 models air intake was via a grille at the rear of the frame, which then connected to a rubber hose to take the air towards the carburettor actually inside the frame. From the frame the air exited into a filter housing, which for the first time saw a disposable paper cartridge which could be changed instead of needed to be washed as in all previous models. It is rumour that the frame breather system was revised as passengers clothes blocked these vents, and it was possible for rain to enter here causing the engine to misfire. The later models gained an air scoop between the two single seats, which then feed down to an air box between the fuel tank and tool box, with this change although the look of the rear grille was kept, the holes of the intake were filled in. The tool box was now positioned underneath the front seat, and access was gained by a door between the riders legs. The fuel tank was also enlarged quite considerably from earlier machines, with a capacity just short of 8 litres. Baffles were fitted inside the tanks to stop the fuel moving around. Small differences were made to distinguish the two models apart, the 125 cc had rubber gaskets on the front floorboards, with alloy "criss cross" patterned channels on top of them. The 150cc had alloy channels, with rubber inserts on top of them, the rubbers were neatly finished off with alloy caps. Both the 15 and the 150 had rear floor boards with raised plastic "tread grips". 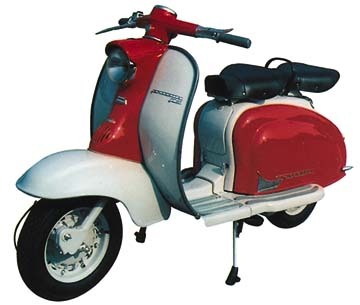 125cc versions had body colour coded handle bar gear change and switch housings, while the 150cc versions were their natural alloy and polished. 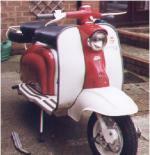 The badging on the Li's long "Lambretta embellishers" on the lower section of the panels. Leg shields wore a crest in the centre of the horn casting, which hid two bolts to help secure the horn casting, and badge clip. On the leg shields was fitted a thin chrome Lambretta badge, with either a Li125 or Li 150 model badge beneath it, again chromed. UK models also gained a round brass badge, with the St Georges dragon on it. All body rubbers and trim were grey, along with the control cables, except for the following :- The stand feet and kick start rubber were black, the rear light body gasket was white. Other improvements were mainly to the engine, with stronger crank and bearings. 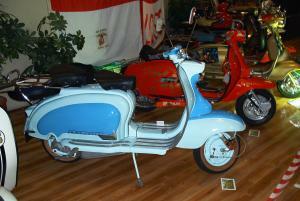 The 125 was available in blue or two tone grey, whilst the 150 had much more colour options. The main body work was grey, with a second colour choice to the side panels and front horn cast of either Coffee, Green, Blue or Red. This machine was to set the future pattern for all Lambrettas, and both the 125 and 150 were a commercial success for Innocenti with over 150,000 examples being made of both engine types.